This Xeroxed volume represents the first crude attempt to put the history of earliest ancient times based on the bible into story form. The main sources for this material are the bible and the two-volume 'Compendium of World History - Volume 1' and 'Compendium of World History - Volume 2'. The reader is cautioned that the incomplete account presented here should not by any means be regarded as the final and authoritative word on the subject. It must be emphasized that this is merely an initial attempt at telling the actual story of what went on in the distant past. Much research remains to be done. However, what has been gathered into these pages will help provide a general, overall concept as to what was really taking place in the centuries before and after the flood. Certainly a more accurate concept than modern-day histories provide. Our tentative plan is to present the story from the creation to the Exodus in the form of four parts or units broken down into twenty-eight chapters. As this is being written, some six chapters are yet to be completed. The gaps have been partially filled in with outlines. Only seven copies of this incomplete version are being Xeroxed at this time for limited library use. Dr. Hoeh has stated, "the time is coming when all history books will be rewritten." Although this monumental task will not be completed till the world tomorrow is here, the work has already begun in earnest. 1. Before Adam — Creation and Chaos. 13. The Activities and Death of Nimrod or The Deaths of Cush and Nimrod! PART 5: ADDED MATERIAL — 1938 B.C. TO 539 B.C. Bible True From Very First Verse — Before "The Beginning" — The Original Creation of The Universe — Earth's First Catastrophe — A Rebellion of Spirit Beings — Evidence From Outer Space — A Picture of Lucifer's World From Geology — Disproving Evolution — with Fossils — Satan's Character. The Cause of Chaos — The First Day — The Second Day — The Third Day — The Fourth Day — The Fifth Day — The Sixth Day — The Seventh Day — The Relationship of Genesis One and Two — The Question of Origins — Location of Eden — Satan's Return. Cain and Abel — The First Murder — Cain's "Mark" — The Curse On Cain — The Proof of Geology — Cain's Society — Cain's Famous Walled City — The Way of Cain — The Line of Cain vs. The Line of Seth and Enos — Seth and Enos — Eight Preachers of Righteousness — Immense Length of Life Before The Flood — The Size of Families — The Population Explosion — Chart: Genealogy of The Two Major Lines of People In The Pre-Flood World. Lamech's Wives and Children — Zillah — Jabal — Jubal — Tubalcain — Tubalcain and Smelting — Naamah — Lamech and Adam — Lamech and Cain — Lamech and Enoch. Tubalcain's Army — Demon Possession — Tubalcain's Military Expeditions — Lamech Versus Tubalcain — The Dual Meaning of Lamech's Poem — The Source of Jewish Tradition — Behind The Facade of Myth is History — Understanding The Myths — Myths Contain The Story of Pre-Flood World. Who Were 'The Sons of God'? — Pre-Flood "New Morality" — Methuselah's Influence — Led Astray By Materialism — Who Were The Nephilim? — Why The Neanderthal Men Vanished From Europe — Archaeology and The Family of Cain — Female Figurines and Other Discoveries — The Nature of Pre-Flood Violence — Segments of Pre-Flood Society — Seven Categories of People. Noah's Life Threatened — Noah Forced To Flee — Noah's Sons — Ham's Wife — Noah's Day Compared With Ours — Criminals Who Lived Hundreds of Years! — Mankind Could Have Been Better — Noah and The Work of God — Beginning of Technology Before The Flood — The Deluge. Universal Flood Traditions — Location of the Ark — Modern-day Reports of the Ark — The Departure from the Ark — Gods Concern for the Human Family — God's First Post-Flood Instructions — Relative Age of Noah's Sons — Ugly Human Nature Asserts Itself — A Major Prophecy About the Races — Basic Facts About Genesis Ten. Noah's Patriarchal Office — Rapid Growth of the Human Family — Noah as Educator-Noah's Original Journey — Did Noah Have Maps? — The Source of the Original World Maps — Maps Before the Flood? — The Time of Earliest Post-Flood Colonization — Rebellion in the Human Family — The Significance of Babel — Noah's Second Journey — The Implications of Noah's Journey — Noah's Itinerary — Noah in Italy — Sabatius Saga — Why In Italy? — Italy and Pagan Religion — Summary of Noah's Life. Area of Earliest Post-Flood Settlement — The Human Family Continued to Spread — Origins of Cush, Nimrod, and Semiramis — Josephus' Account — Bible Reveals Nimrod's True Character — Nimrod's Tactics — The Bible Account of Babel — The Rebels' Aspirations — The Ancient Babylonian Account. Proving the DATE of Babel — The Testimony of Chinese History — What Happened in 2254? — Population at Babel — Invisible Powers Behind Babel Project — The Example of Hitler and the German People — "The Beginning of His Kingdom Was Babel" — Introducing Asshur — Asshur and Nimrod — When Did God Intervene at Babel? — Why God Had to Intervene — The Debacle at Babel — The Origin of Languages — The Dispersal of the People — Ultimate Fate of the Tower of Babel. CHAPTER 13: The Activities and Death of Nimrod or The Deaths of Cush and Nimrod! The four centuries following the Flood were some of the most crucial — if not the most crucial — in all human history! 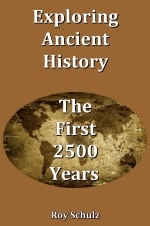 These centuries witnessed a tremendous struggle for control of humanity! The story of, these vital years is covered only in the briefest manner in the Scriptures, yet God wants us to know what was happening! When the major events of these crucial decades are made plain, the Bible account takes on new meaning! This most crucial period in the story of human experience is neglected in most histories. Historians, in private, consider it a very controversial era still requiring much research. Yes, There was not only an all-important "lost century" in the history of the early true Church of God — there was also a vital period of some "four lost centuries" after the Flood! When the influential occurrences of this period are made known, the world will understand to a immeasurable greater extent where its problems originated! This time in early post-Flood history revolves around the lives of seven key individuals — Noah, Shem, Cush, Nimrod, Semiramis, Asshur, and Horus (or Gilgamesh), These influential personalities carried on their wide-ranging activities of government and conquest as the tiny human race was just beginning to grow in numbers. Their leadership shaped the future course of the small but expanding world population. The impact of these individuals and their prominent contemporaries upon human history has never been fully realized until now — the time of the end! The Extent of Abraham's Wealth — The Assyrian Empire — The Attack into Canaan — Abraham's Victory — Assyria Halted — How This Changed History. The astounding evidence of history proves that Abraham actually had AN IMPACT FELT BY THE ENTIRE ANCIENT WORLD! The account you are about to read will show that Abraham was the first key figure in the history of Austria, that he greatly influenced ancient EGYPT and that under God's guidance, he completely changed the course of ASSYRIAN history!! This is the story behind the story of Genesis eleven, twelve, thirteen and fourteen! Modern historians, by rejecting the Bible, have thrown away one of the most fascinating historical dramas of all time and have robbed students at all ages of the truth about mankind's past. Modernist scholars regard Abraham as "a mythological hero." Dr. William F. Albright, dean of American archaeologists on the other hand, promotes the theory that Abraham was a donkey caravaneer who plodded back and forth between Egypt and Canaan! In short, the picture we are asked to accept is that, if Abraham existed at all, he was backward, ignorant, and primitive. For 4000 years the world has sought to hide the astounding fact that Abraham was an influential ruler and leader. He was a man of great wealth, and a skilled scientist, astronomer, and mathematician — a well-known figure who had a great impact on the society of his day. When God called Abraham he was not calling someone from the "back woods" or "slums." God called a man of great personality, capability, and potential to carry out His purpose. It is time the history errors were rewritten. It is time for the true picture to be presented. Manetho and Egyptian History — The Plot That Distorted History — The Actual Source of the Conspiracy — The True Concept of Egyptian History — The Bible and Egyptian History. Cush and Mizraim — Cush, Nimrod, and Semiramis — Semiramis and Horus — Shem Changes the History of Egypt! — Egypt to the Beginning of Dynasty Twelve — Sesostris the Great and the Egyptian Empire. Jacob in Mesopotamia — Joseph Sold into Egypt — The Importance of Dynasty Three — Joseph and Dynasty Twelve — The Achievements of Amenemhe III — Dynasty Twelve was Dominant. When the Israelites Came to Egypt — The Land of Goshen — The Israelites' Occupation — The Land of Rameses — A "Rule of Twelve" — Israelites and the Egyptian Empire. Cheops was Job — Internal Evidence in the Book of Job — WHEN did Job Live? — Job in the Fourth Dynasty — Job's Domain — (Remainder of Chapter yet to be Written). Old Testament Israel had more contact with Egypt than any other ancient nation. Consequently it should be possible, with the many clues the Bible provides, to solidly harmonize their two histories. In Part Three we have already seen the impact Abraham had on Egypt in early patriarchal times. We have also seen how Shem remarkably changed Egypt's history and governmental structure. But Joseph also went to Egypt — and his father and brothers! Job was there also! And when Moses left the second time — at the Exodus — the land of the Nile was left in an absolute shambles! All of these stories are plainly recorded in the Bible. But how are these personalities and events reflected in the Egyptians' own history? If Joseph was second in command over the whole nation, would not his name appear in some dynasty? And who was the Pharaoh who appointed him to his high position? The Bible does not name him — does Egyptian history? When did Israel and his children come to Egypt? Can we provide exact dates for the seven years' famine? Just how long did Joseph rule? Where does Job fit into the picture? Just exactly what territory was included in "the land of Rameses?" And who was this Rameses in the first place? The Apostle Paul recorded that Moses was withstood by Jannes and Jambres. Who were these men? Who was the Pharaoh who enslaved the Israelites? Can we prove the date of Exodus? What was the name of the Pharaoh who drowned in the Red Sea? Who invaded Egypt after God brought upon that nation its greatest catastrophe? Modern history books do not provide the answers to these vital questions. They either ignore them — or confuse the issue. But the real story behind the story of these events is now becoming clear as the following pages will demonstrate! ANCIENT BABYLONIA FROM 1938 B.C. TO 539 B.C. From 1938 B.C. to 539 B.C.